Favorites Path Finder 8 not equal Favorites Finder. But you can drag your "old" favourites folder from the library to the side bar, and you can also do this for "saved searches or other alias files. Not quite the same but may work for some. Favorites Path Finder equal Favorites Finder. Yes, this discussion and the other one are confusing. We should distinguish between the Sidebar's Favorites and the Favorites folder. @portaferry seems to be discussing the latter, but @yixuan_s I think, the former. If I remember correctly from PF7, in the main menu there was Go > Favorites which navigated to the Favorites folder. But it is not there in PF8 and I can't find a way to bring it back. I wish there was, because then I could set a keyboard shortcut to it. I had my Favorites folder in the sidebar in PF7, but it was not there when I upgraded to PF8. As @portaferry says, you can easily bring that back – the folder you want is ~/Library/Favorites. So this is just a matter of PF8 not honoring my sidebar preferences from PF7. A minor bug, now worked around. As far as syncing with the Finder Favorites, the Sidebar Favorites never were synced – I would love to have Air Drop in my Path Finder Favorites, but it only appears in my Finder favorites. The Favorites folder, once you restored it as described in the previous item, was synced in PF7 and is still synced in PF8. This is screwing with my workflow that I have got it to what I needed since pf6 . I need that pf sidebar where I can drop my stuff in it, and then Automator -> open finder item , I can see it and do my automator thing. Not a happy PF8 user! If you want to add a folder from Path Finder's browser window into the ~/Library/Favorites, which is in your Sidebar Favorites, select and drag the folder to the ~/Library/Favorites in your Sidebar Favorites, but just before you drop it, hold down the control key on your keyboard. Because of the 'control' key, nstead of moving the file, it will create a Finder Alias. This is not a symbolic link but works the same for this purpose All of the items in my ~/Library/Favorites are in fact Finder Aliases. I think this is normal. I'm still wondering why Cocoatech removed the Go > Favorites main menu item. Or am I just imagining it was there? with Path Finder 7, i could put a file in the sidebar Favorites. Now, with version 8, it seems to be impossible. Am I wrong ? In answer to fred t.: It appears to me that you can drag in folders, but not regular files. That is kind of weird. "That is kind of weird." Fred, I suppose the workaround is to drag ~/Library/Favorites, or actually any folder for that matter, into the Sidebar, and then drag+control your favorite regular files into that folder, as explained in previous posts. The disadvantage of accessing a regular file in this new way is that it will take two clicks instead of one. The advantage is that you can have more favorite regular files without filling up your Sidebar. "the workaround is to drag your favorite regular files into a favorites folder" it's actually what i've done. "The advantage is that you can have more favorite regular files without filling up your Sidebar." i think every user should have right to chose alone if he/she wants to have a sidebar filled up with files or if it's better to put all in a folder. For years i am using Path Finder I had only one file I could access from the sidebar. Path Finder Support Team closed this discussion on 27 May, 2018 03:40 PM. Thanks for your help jerry. Will try it. For the PF developers, I don't know where you are going with this PF product, but its not the right direction. Nothing like upgrading to a new version only to discover none of the v7's preferences and sidebar "places" came along for the ride. Why is this beta software being touted as ready for prime time??? Not a fan! Back to 7. Path Finder Support Team closed this discussion on 28 May, 2018 04:37 PM. Seriously why the hell doesn't the favorites transfer over from Finder? I swear to god every time I start pathfinder my favorites are gone, and I spend so much time navigating to each folder to move them over. I must have done this at least 15 times by now. And they're still available on normal Finder, but not PF8. Can we please get this fixed? I had to pay for this upgrade to PF8 and this one issue is making me regret it completely. This thread is from May and I thought this issue would be addressed by now, but I've been silent for way too long. Path Finder Support Team closed this discussion on 20 Aug, 2018 06:29 PM. I have exactly the same problem. It's very frustrating. Path Finder Support Team closed this discussion on 21 Aug, 2018 12:21 PM. I'm having the same problem with the Favorites - as soon a PF8.1 crashes (MBP 15 2018 macOS 10.13.6) I loose all the carefully selected Favorites & PF resets to default - THIS DRIVES ME NUTS. I'm using PF since the very beginning and if this cannot be fixed it would really be a deal breaker for me. I do understand that we cannot have the same as Finder anymore but PLEASE make the PF8 Favorites work consistently on their own ? Why does it not work to use "File/New Browser/Save Browser" for this purpose - it does save it but then I have to manually choose this saved-version AND any new window just reverts to default (am I missing something) ? yes i realized that I can restore the killed "default-changed Favorite" by restoring the Prefs folder from /Library/Application Support/Path Finder/ but then cannot be the solution, can it ? Then I realized that maybe macOS 10.13 "App Translocation" could be the culprit - so I remedied this with [xattr -d com.apple.quarantine /Applications/"Path Finder.app"] but still to no avail ? could anybody of the CocoaTech Team please help - just want my Favorites to stay or easily restore them - "File/New Browser/Save Browser" & then "File/New Browser/Restore Browser"
ps: oh by the way - while I'am at it - why does the "Drop Stack" not expand anymore and shows the content when used - is it really necessary to have to click the triangle every time you want to use it - then the feature is no longer any time saver. Path Finder Support Team closed this discussion on 24 Aug, 2018 03:53 PM. I have the same issue but with respect to having a saved search in the sidebar favorites. It is no longer possible to have a saved search folder there - instead you can favorite the "saved searches" folder 1 level up and THEN select the search folder you want. So, two steps instead of 1. Not the end of the world but annoying. I'm on the 30 day trial and will revert to PF7 if this doesn't get addressed by the end of the trial period. Path Finder Support Team closed this discussion on 25 Aug, 2018 04:12 PM. PF 8 now requires you to save any edits made to your sidebar pane including any folders you drag into the Favorites for future access. If you close the PF window before saving, then any folders previously dragged into the Favorites in the sidebar will not appear in a new PF window. PF 7 and previous versions automatically saved the sidebar changes, but PF 8 now requires clicking on the gear symbol in the upper left hand corner of the sidebar, then clicking on the drop down at the bottom of the settings window that opens, and saving the altered sidebar with a new name. Doing so will now allow new PF 8 windows to open with the saved folders and other changes you made to the sidebar. Hy Bryan - Thank You and YES this helps absolutely. I did figure that one can save the Sidebar Favorites but did not know that you have to save it every time again when you make changes. Path Finder Support Team closed this discussion on 29 Aug, 2018 02:22 PM. It also drive me nuts to have a different of sets of favorites between my finder and PathFinder for which I paid my upgrade ... this is very frustrating. Cocoatech team we're counting on you to fix this! Path Finder Support Team closed this discussion on 05 Sep, 2018 01:56 PM. I have to say that I am not a fan of the new favorites at all. They are pretty useless. They don't exist on the go menu. 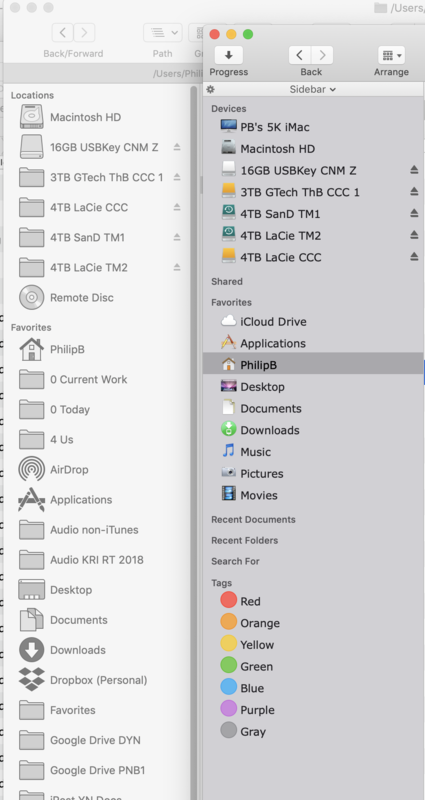 They don't sync with finder favorites and are therefore not present in any of my file dialogs. Why bother??? Path Finder Support Team closed this discussion on 12 Oct, 2018 06:39 AM. The Path Finder 8 favorites not syncing with Finder favorites is a big mistake, as it breaks the idea of Finder replacement: every time a software calls the finder for opening or saving a file, the user cannot find his usual favorites. Please bring back this basic feature! PLEASE restore the Favorites feature as it was in PF7!!!! Others have mentioned that Default Finder X has been a great help in these tribulations with PF8. PF8 seems happy to integrate with Default Finder X - which is customisable and also has a "save to" favorites group. Other posters have also mentioned value of Default Finder X. Path Finder Support Team closed this discussion on 04 Dec, 2018 03:39 PM. I perfectly agree with portferry. Path Finder 8 favorites not syncing with Finder favorites is a big mistake, as it breaks the idea of Finder replacement. Please bring back this basic feature! Path Finder Support Team closed this discussion on 13 Dec, 2018 01:03 PM. Exactly. Have same problem with not syncing of favourites. Cocoatech - what's is you position finally? Path Finder Support Team closed this discussion on 25 Dec, 2018 12:38 PM. Hello, I am a PathFinder 7 customer and I'm finally getting around to trying the upgrade. I'm having a problem with PF8 no longer calling the main sidebar "Places" and it is now called "Favorites" --- these are not the folders I have set up as Favorites. In PF7, I have a favorites folder which I could also include as a separate group in the sidebar. There is no way to do this in PF8. The sidebar only lets me add the Favorites folder to the Favorites grouping and not only does this make less sense, it is a step backwards from the way it worked in PF7 in multiple ways. Not only does the user lose the Favorites group, the Favorites dropdown from the Toolbar has also been removed in order to support this bad decision. My only option now is to either include the Favorite in the Bookmarks bar or in the "Favorites" (Places) sidebar, which in both cases means spending time to find Favorites among other list items and once I access the folder, then the folders I need are visible but I never had to think about it in PF7. Path Finder Support Team closed this discussion on 05 Jan, 2019 09:41 AM. It's really really annoying that Path Finder doesn't use the same Favorites as Finder. At the moment I just can say: I really cannot suggest to upgrade to Pathfinder 8. Until version 7 everything was great. But this is disastrous. My suggestion: If you can, don't upgrade until this (in my opinion) really serious and time consuming problem is fixed! Unbelievable that we are at 8.3.7 and this essential function is not working properly. Path Finder Support Team closed this discussion on 13 Jan, 2019 11:08 AM. My suggestion is not calling the main sidebar panel Favorites but call it "Places" as it is previous versions. This will minimize confusion I think. Path Finder Support Team closed this discussion on 14 Jan, 2019 10:02 AM. I organized / mirrored (manually) my Finder sidebar to the PF 8.3.6 sidebar yesterday BUT today PF 8 is back to its default!!!! Whats the point? Path Finder Support Team closed this discussion on 16 Jan, 2019 11:06 AM.